I gave myself a Christmas present this year: I removed a lot of things from my room. I’m in the midst of removing more things from my office. At first, I was just cleaning up. It took two trips to get all the paper to the recycling bin from the corner where I put my recycling box. A while ago, I said, “I’ll deal with that later” as it began to stack up past the top of the box. Sorting out the keeper mail from the ads and notices. Putting books back where they belong. I quickly hit a snag. There wasn’t enough space in my room to put everything away! 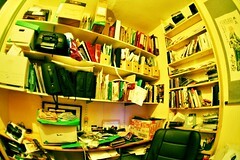 The clutter was more than disorderliness: it was excess. Like Joseph seeking a resting place for Mary, I spent Christmas eve trying to find a place to tuck away my stuff. Staring into a cabinet, I realized that it was tidy because I had not used many of the items since I moved into this room – and that was six years ago! The blog 365 Less Things intrigued me, not only because the incorrect use of “less.” The author reported daily on her effort to dispose of one item a day for the last year. She photographed and described many of the items, and reflected on why she held on to them for so long. She offers tips on getting rid of the stuff, methods for recognizing that something might be disposable, reflections on the reasons so much accumulated. I was especially taken with her self-management; keeping the project going for a full year was certainly not easy. Not having a whole house to deal with, nor the time for a daily posting, I’ve decided to try my own year long project of decluttering and simplifying. Having to stop decluttering to get my grading finished, I’ll look for opportunities to dispose of something by the end of the week – and share the process with you over the coming year. Next The Lord Has a Plan – are we part of it? I now live in a mobile home. Believe me, I think twice before I bring ANYTHING new into the house! There is very little storage space, and it forces a person to ask herself “Do I really need it?” when tempted to buy more “stuff.” I’m realizing how much I can do without. I laughed right out loud at your “incorrect use of the word ‘less. '” That’s a big pet peeve of mine! The abuse is so prevalent nowadays, even among educated people. This is an interesting idea (and I’ve already read the “Dead Tech” post), and I periodically eye my stashes with this purpose in mind. A year ago, one of the gals with whom I work put out a call for books to replenish a library in a small town in Tennessee that had been hit by the flood. I took a 10-ream box home and filled it with a nice variety. I could not tell you which books I put in that box because they were that unimportant to me; and, yet, those books had been taking up visual and physical space in my home. I wish you well in your quest. You hit on something interesting that I’m noticing too. When I actually looked into closets and bookshelves, I was surprised at some of what was there: it had been so long since it was useful that I had forgotten about it – although it was filling up my storage space. By the time I get to Week #52, it may be harder to do this, but right now, it’s really a matter of clearing out deadwood.